Posh star George Boyd scores from long range against Huddersfield. Photo: Joe Dent/theposh.com. Peterborough United boss Grant McCann reckons Marcus Maddison’s wondergoal against Shrewsbury was better than George Boyd’s famous goal from the halfway line in a Championship game against Huddersfield in October 2012. Maddison took aim and let fly from 40 yards wide on the touchline and his wind-assisted strike flew past highly-rated on-loan Manchester United goalkeeper Dean Henderson. George Boyd's strike against Huddersfield flies over the goalkeeper into the net. Photo: David Lowndes. McCann had a great view of that goal and of Boyd’s against the Terriers as he played in that match. “I set George’s goal up,” McCann stated with tongue firmly placed in cheek. “George’s was an instinctive finish from a quality player, The goalkeeper was some way off his line and he lobbed him from a long way out. “The technique Marcus showed last weekend made his a better goal in my opinion. The moment of brilliance from Marcus Maddison that won the game for Posh against Shrewsbury. Photo: Joe Dent/theposh.com. “It was an incredible piece of skill in tough conditions, but if anyone was going to do it, it was going to be Marcus. “He actually scored a similar goal in training two weeks ago so we knew he had that sort of goal in his locker. He was probably the only player on the pitch capable of scoring such a goal. 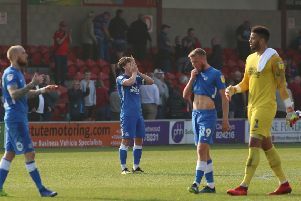 Maddison certainly answered McCann’s call for other players to help top scorer Jack Marriott with the goalscoring burden. It was Maddison’s fifth goal of the season in all competitions. George Best in his Fulham days. The best goal of all-time at London Road is usually given to George Best’s piece of brilliance for Fulham in a 1976 League Cup tie. Best received the ball on the edge of the area, trapped it, flicked it into the air and volleyed it into the top corner of the net in front of a crowd in excess of 16,000. Barry Fry and George Best together at London Road.